Peter was born on 27th November, 1931 at Campbelltown, Tasmania to parents George and Fanny Richards. 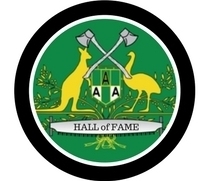 Peter had five children, Anthony, Yvonne, Paul, James and Adam and worked as a sawmill and logging contractor in the North East of Tasmania. His favourite pastimes included chopping (of which the standing block was his preferred discipline) and fishing. Due to a childhood accident Peter was a partial amputee, having only two fingers and a thumb on his left hand. All through his chopping career and right up until ill health forces his retirement in 1985, Peter was active in the chopping community supplying blocks and logging equipment for the majority of carnivals in the North East. He was a formidable and revered opponent in championships against the top axemen of the day. 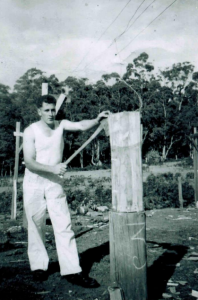 He was asked many times by top Tasmanian Champion Axemen in the 60’s to compete in mainland shows, but due to work and family commitments he was forced to decline. 1958 – Pyengana 18inch Elimination Championship with a £200 prize, competing agaisnst Joe Hurst. In making only his second apperance in competitive chopping matches, 19 year old Peter Richards scooped the pool at the Pyengana Easter Sports Carnival. P Richards defeated Ron Youd and R Richards in the 9inch. In the 10inch he accounted for L. Binns and Athol Rattray, and in the 12inch he won from J. Pentland and G. Binns.